When you finish reading, look at the bottom of the page for your assignment. Callie and Artie were born diggers. At five years old, they shocked their mother when they buried their toddler sister, Mica, up to her neck in sand. One summer vacation, while the Marble family relaxed on a San Diego beach, Callie dug a deep hole in the white sand. She wet the sides carefully so the sand wouldn’t keep caving in. She thought, "I'm going to bury Mica. Artie will think it is fun to lower her into a deep hole in the sand. Only MIca's neck and head will show!" She called over three-year-old Mica and her twin brother Artie, “Mica, we're going to put you in this hole. Then we’ll cover you up to your neck.You’ll be a Sand Princess! Mica just smiled. She loved it when Callie included her in their playing. The tot bent her arms and stiffened them. Now the twins held her elbows and lowered her slowly into the hole. She didn’t move until they said, "Straighten your arms to your side." Artie helped shove sand around Mica. Callie grabbed a bucket to scoop the sand faster. "Isn't this fun?" they said as they patted sand gently around Mica's neck. Only Mica’s neck and tiny blond head. Callie rolled up a towel to support her head. Artie went back to collecting shells in his beach bag. Callie stuck a small beach umbrella nearby to shade her from the sun. Mica enjoyed this attention. She smiled up at Callie, "I'm a Sand Princess." A few minutes later, Mrs. Marble looked up from her book. She couldn't believe her eyes. Mica was only a head in the sand. The digging had gone too far. "I just checked on you kids. Oh, no! Mica is buried up to her neck!" Poor little Mica had fallen asleep. White sand outlined her little blond curls. Pretty shells and rocks circled her neck. Callie had buried a water bottle with a bendable straw near her mouth. When she woke up, she could take a sip. "Callie, you little digger dynamo, pull Mica out of that hole! You can't bury someone so deep! The waves are getting bigger. The tide is coming in! Help!" Join in the fun and Choose: Click next word to move on to your choice. 2. Do you know what sand looks like under a microscope? 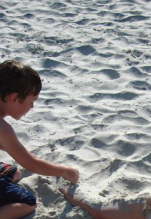 Explore an expert sand photographer's website. You hope Mica will be saved before the wave hits her.